The Global Fund has made considerable progress in many areas, the Office of the Inspector General says in its 2017 annual report, and has reached a point where many of the remaining challenges are beyond the ability of the Fund, acting alone, to resolve. Supply chain issues and quality of services top the list of challenges. Now that the respective headquarters of Gavi and the Global Fund will be located together in the Global Health Campus in Geneva, cooperation between the two organizations will intensify. There has already been considerable collaboration between the two organizations. Donors are supportive of joint activities among global health funds. A report presented at the 39th Board meeting on 9-10 May 2018, in Skopje, Macedonia, provided an update on the implementation of activities under the objectives and sub-objectives of the Global Fund’s 2017-2022 Strategy. In this article, we provide a general overview of progress to date and specific examples related to Strategic Objective 3: “Promote and Protect Human Rights and Gender Equality”. Currency fluctuations are a major concern for Global Fund stakeholders, particularly recipient countries whose domestic currency can experience significant shifts over relatively short periods of time. The strength of both the US dollar and the Euro in recent years has further exacerbated this issue for many countries. However, a significant portion of Global Fund grant monies are managed in ways that limit their vulnerability to such local shifts, thereby protecting grants from major losses due to unfavorable foreign exchange rates. A two-day meeting attended by civil society and community advocates, the Global Fund, technical partners and state representatives has equipped participants to more meaningfully engage in the implementation of Global Fund grants in the African region. Adèle Sulcas joined Aidspan as Acting Editor on 7 June 2018. She will be responsible for editing the Global Fund Observer. These were the words of the Office of the Inspector General (OIG) in its 2017 Annual Report which was presented to the Board at its 39th meeting, in Skopje, Macedonia, on 9–10 May. The OIG said that its work in 2017 confirms the steady progress of the Global Fund – programmatic achievements are substantial; there have been considerable investments in health systems; financial mechanisms are increasingly mitigating the risk of financial loss; the Secretariat is improving internal operations; more rubust technologies are supporting grant management processes; and risk management is maturing. However, a number of challenges remain, the OIG said, particularly with respect to the supply chain and to quality of services. “The persistence of issues related to quality of services also reflects to a large extent the challenges inherent in both an operating model that is highly contingent on the effectiveness of a broader partnership and the often weak environment in which grants are implemented,” the OIG stated. Below we summarize what the OIG had to say about the supply chain challenges and other issues, including risk management, assurance and health systems. The article concludes with sections on OIG operations and agreed management actions. According to the OIG, there are four systemic root causes of the supply chain challenges –– inadequate leadership and governance structures; insufficient funding; limitations in data for decision-making; and a lack of trained health staff. The Secretariat established a dedicated supply chain team in 2017. A detailed implementation plan has been developed to support the roll-out of a comprehensive supply-chain strategy. The OIG said that the strategy takes a more comprehensive, end-to-end approach including both upstream and downstream processes: forecasting, logistics, capacity building, data, investments, key performance indicators, risk management and assurance. “However,” the OIG said, “actual progress on implementation remains limited at the time of writing.” Twenty countries have been selected for holistic supply-chain diagnostics by the end of 2018 but only three have been completed to date, the OIG said. The OIG said that good progress is being made towards embedding risk management into core grant decision-making processes. The risk team is now substantively involved in upstream grant-making. During 2017, the team reviewed 72 of the 105 funding requests in Windows 1 and 2. In addition, the annual funding decisions process now includes a risk clearance step before a disbursement can go through. The risk team reviewed over 250 annual funding decisions in 2017. The OIG told Aidspan that when reviewing a funding request, the risk team assesses whether there are risks that might impede the program from meeting the objectives of the request; whether these risks have been adequately addressed; and whether further discussion of these risks is required during grant-making. When reviewing the annual funding decisions, the risk teams review the risk analysis done by the country teams in high-impact and core portfolios to ensure that all relevant risks have been identified and appropriately prioritize; that planned mitigation measures are adequate to manage the risks; and that appropriate assurance mechanisms have been identified. With respect to risk appetite, although the notion of explicitly setting risk appetite had little traction in the past, the OIG said, there is now a general consensus at both Board and Secretariat levels not just on the concept but also increasingly on its necessity. The risk appetite framework –– which the Board adopted at its meeting on 9–10 May (see separate article in GFO 366) –– contains high-level statements, the OIG said, but a mature risk framework will require a cascading mechanism that translates these high-level statements into actual operational guidance. The OIG revealed that when RSSH (resilient and sustainable systems for health) activities have been embedded in a disease grant, absorption has generally been better. a lack of clear performance metrics and indicators of success to both effectively gauge progress and assess the real impact of the investments. Given these implementation challenges, the OIG said that as part of its 2018 plan it will fully review Global Fund-financed RSSH activities, including risk management, oversight arrangements, monitoring, performance indicators and results measurement. The OIG revealed that programmatic assurance activities such as ‘On-Site Data Verifications’ and ‘Rapid Service Quality Assessments’ were discontinued as they did not provide the level of assurance needed. They were replaced with various programmatic assurance options, including Health Facility Assessments, but these have not yet been fully executed as per the Secretariat roll-out plan. First, although fiduciary risks have been significantly mitigated over the years, the grants are never immune to potential misuse of funds. Any such occurrence could significantly set back the organization and shake donor confidence at its core. Second, in the absence of clearly expressed risk appetites there is an inherent –– albeit unconfirmed –– assumption that donors have a much lower appetite for financial risks and a comparatively higher appetite for programmatic risks. The current assurance model reflects to a large extent that underlying assumption. Third, while financial risk management and assurance rely on fairly well established and tested processes and mechanisms, programmatic assurance remains an evolving field. There are no uniformly accepted frameworks and, to a large extent, the Global Fund is facing the same challenge as other international aid organizations in trying to design models and approaches that are systematic yet tailored to the specific needs of each portfolio. Fourth, in addition to the lack of uniformly accepted frameworks, programmatic assurance has also suffered from limited and generally inadequate tools. The Secretariat has recognized this gap and is taking steps to address it, such as the recently completed Assurance Handbook. But more still needs to be done in this area. Lastly, where financial assurance generally covers a fairly self-contained set of activities, programmatic assurance is far broader and its objects (for example, data quality, service delivery, health facility conditions, etc.) extend far beyond the confines of Global Fund grants. Programmatic assurance often involves more interdependencies and requires a more integrated approach with all stakeholders. The OIG published a record 28 reports in 2017. The Investigations Unit screened 207 allegations of wrongdoing compared with 180 in 2016. Secretariat reporting increased by 26% and implementer reporting by 138%, partly due to outreach initiatives such as the OIG’s anti-corruption campaign, “I Speak Out Now!” This included allegations from sub-recipients and sub-sub-recipients for the first time. The average number of weeks to finish an engagement was 25 for audits (vs. 26 in 2016) and 38 for investigations (vs. 51 in 2016). In its annual stakeholder satisfaction survey, the OIG received 89% satisfaction ratings from members of the Board and the Audit and Finance Committee (AFC). The OIG’s Audit Unit received the highest possible rating (“generally conforms”) across 44 dimensions in the triannual external quality assessment by the Institute of Internal Auditors. The OIG’s Investigations Unit also received the highest rating of “fully compliant” with the Uniform Guidelines for Investigations of the Conference of International Investigators. The OIG’s annual report outlined its 2018 work plan (see Figure 1). Finally, the OIG said that its three-year rolling audit plan for 2016–2018 will have enabled the OIG to cover 75% of the allocations to countries (see Figure 2). In a separate paper, the OIG and the Secretariat provided a progress report on the status of long overdue agreed management actions (AMAs) stemming from OIG audits and other reports. As of 28 February, there are 24 overdue agreed management actions (AMAs), of which 17 are considered long overdue (i.e. more than 90 days late). All but one of the long overdue AMAs are more than 180 days overdue. The total number of overdue AMAs has decreased by 38% since February 2017 (down from 39). 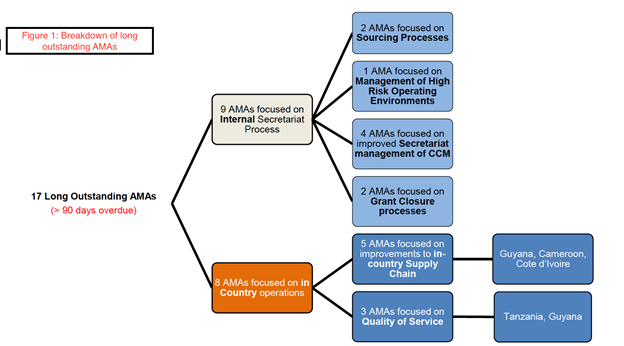 The long overdue AMAs are evenly split between internal Secretariat processes and country grant portfolios (see Figure 3). The OIG stated that the Secretariat has made considerable progress in closing recent AMAs before they become 180 days late.